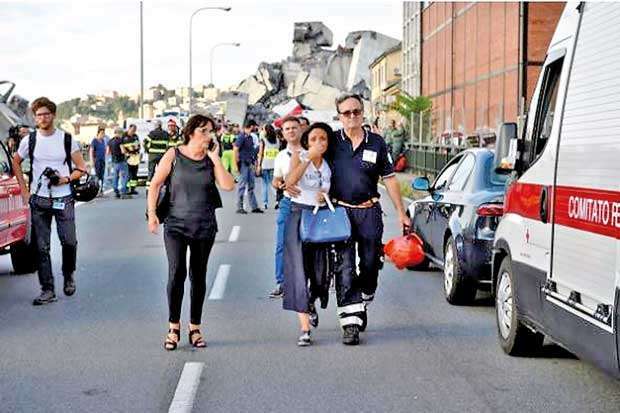 Italian rescuers searched through the night Wednesday for any survivors under the shattered remains of a motorway bridge in Genoa as investigators probed what could have caused such a catastrophic collapse. 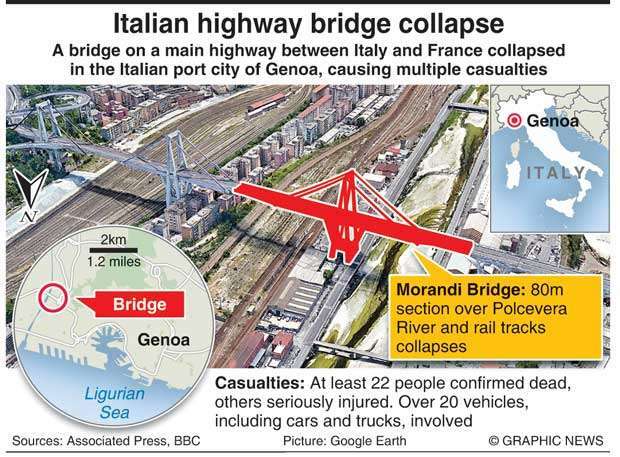 More than 30 people were killed on Tuesday when a vast span of the Morandi bridge collapsed during a heavy rainstorm, sending about 35 cars and several trucks plunging 45-metres onto railway tracks below. Rescuers spent the night within the tangled remains of the bridge under floodlights and there are fears the toll could rise in what the Italian government has called an “immense tragedy”. “Unfortunately there are around 30 dead and many injured in a serious condition,” Interior Minister Matteo Salvini said on Wednesday, vowing that those responsible would “pay, pay everything, and pay dearly”. On Wednesday morning, sources in the interior ministry quoted by Italian media estimated that the death toll had risen to 35, including three children aged from eight to 12 years old. Sixteen people are also wounded, including 12 in serious condition. - ‘Not giving up hope’ - Rescuers scoured through the wreckage, strewn among shrubland and train tracks, as rescue helicopters winched survivors on stretchers from the ruined bridge.